Easter is the most important day in all of Christianity. On that first Easter morning, death was banished and eternal life was secured by the resurrection of Jesus Christ. That is a message the world needs to hear. The people in our churches need to be constantly reminded of the significance of the death, burial, and resurrection of Jesus. The weeks leading up to Easter Sunday provide an excellent opportunity to do that. The Easter season is also one of those rare periods where some non-churchgoers may show up at your services. People who don’t regularly attend church, many who are unbelievers, will come with their family to keep some tradition going. Or to please their mothers. Regardless of their reasons for attending, I don’t believe in coincidence. God is working in their lives. He brought them to the service to hear about Him and His eternity-changing Gospel. Pastors have the chance to lead them to see what Jesus did for them. As a pastor, a pre-Easter sermon series gives you several weeks to focus your church completely on the cross and the resurrection. You can take your time to really hone in on the events that took Jesus to Golgotha and the now empty grave. To help get you started on a series, I want to present you with three series ideas. These ideas can be developed into a sermon series lasting from four weeks up to seven weeks or longer. If you have a suggestion for a series, please share with all of us in the comments below. The events of the week leading up to the crucifixion and resurrection were predicted hundreds, even thousands of years before they happened. The Old Testament records these prophecies. A series covering some of these prophecies can give your church a new perspective on God’s eternal plan of redemption. Here are some Scripture passages for building a sermon series on the Old Testament prophecies. In Genesis 3, we find the earliest prophecy of the Messiah. After the sin of Adam and Eve, God has a word for the serpent. There is a “He”, someone who will crush the head of the devil. The Lord provided covering for Adam and Eve with clothes of skin. Skin sacrificed by innocent animals. One day God would provide a covering for us through the innocent blood of Jesus Christ. God gave the Israelites instructions for observing the Passover. Part of those instructions covered the proper procedure for preparing the sacrificial lamb. As our Passover Lamb, this points directly to John 19:36. Jesus is the fulfillment of the Passover Lamb. The Psalms hold a wealth of prophecy information concerning the Passion week. The “Son of David” is featured prominently in many Psalms. Here are a few passages of note. Could this be Jesus’ perspective from the cross and the grave? So much of this Psalm point to the crucifixion. The accomplishment of Jesus through His resurrection is foretold in Isaiah 25. The Old Testament prophecies are specific, leaving no doubt who the Messiah is when He arrives. One of the great prophetic passages in the entire Old Testament. Isaiah 53 could be used for a sermon series all on its own. I’ve pulled out just a couple of the many poignant verses. Such a total and complete picture of our Lord’s life and sacrifice. What a Savior! Palm Sunday, predicted hundreds of years before the event. Even the most sinister events of the Easter weekend are predicted. Grace and mercy are available, even to those who pierced Jesus with the nails of the cross. And who of us is not guilty of putting Jesus there? There are ample Old Testament passages to build a pre-Easter sermon series. The seven sayings from the cross have been a source of sermons for many, many years. They would also lend themselves well to a seven-week sermon series leading up to Easter. Here’s a list of the seven passages recording the seven times Jesus spoke from the cross. “The Word of Forgiveness.” Even on the cross, even to those who nailed Him to the cross, Jesus offers forgiveness to those who will turn to Him. “The Word of Salvation.” Salvation is available through Jesus to anyone who trusts in Him, regardless of how they have lived. “The Word of Relationship.” Even as He hung on the cruel cross, His thoughts were on the wellbeing of others. “The Word of Humanity.” Even though Jesus knew from eternity He would be the “lamb who takes away the sins of the world” He still felt the pain of abandonment. “The Word of Distress.” Jesus, as He was dying a cruel death, still fulfilled the prophecies of Scripture. “The Word of Triumph.” Tetelestai – all that Jesus came to do was complete. “The Word of Reunion.” Now that Jesus had completed His task, He would be reunited with the Father. The seven sayings of Jesus from the cross is a treasure trove for a pastor wanting to preach a pre-Easter sermon series. 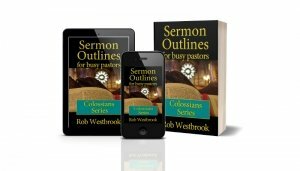 Several years ago I preached a sermon series I called “The Road to the Hill.” You can find that series, and 15 more Easter sermons, in Sermon Outlines for Busy Pastors: Easter Sermons. This series began three weeks before Easter. Easter Sunday’s focus was the resurrection. The last sermon was preached one week after Easter. Here is a brief overview of each message in this 5-sermon series. Why Should Easter Matter to Me? I used Genesis 3:1-7 as a launch point for seeing why there had to be a crucifixion and resurrection. What does Easter have to do with you? Everything. I examined three encounters Jesus had with people as He “set His face toward Jerusalem.” These encounters parallel our lives and how Jesus will respond. Tetelestai – it is finished. What did Jesus intend to express through this Greek word? The fourth sermon in the series was a strong evangelistic message. I knew some would attend Easter Sunday, if for no other reason than to be with their families. I wanted them to comprehend the greatness of Jesus, His crucifixion, and resurrection. I wanted to present the Gospel as plainly as possible. Forty days after the resurrection, Jesus called His disciples together. He gave some instructions and then He ascended into heaven? Is that all Jesus had to do? Is He doing anything now? Three different angles, three different perspectives, at approaching Easter. All with a pinpoint focus on Jesus Christ. I hope these ideas will help you as you develop a pre-Easter sermon series. Do you have another idea for a series leading to Easter? Share that idea in the comments.